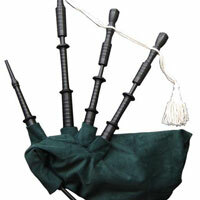 The Pipers’ Choice Basic Highland Bagpipes offer you a great set of Highland Bagpipes at an affordable price. The pipes are made from Delrin. The projecting mounts and ferrules are black, and drones are combed. The pipes come with a synthetic bag, with synthetic drone reeds, pipe cover, and cords. The chanter reed is a cane reed. These pipes are fully set up and ready to go. If you are looking for a set of bagpipes that look great, sound great and come at a great price, then these pipes are for you.